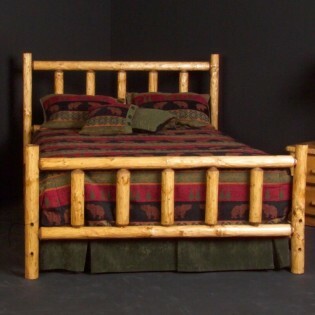 Each piece of this rustic Alpine Log Bed is hand hewn or draw knifed to give it its unique character. The bed is constructed of three inch logs that are mortised, tenoned, screwed and glued together. Each piece of this rustic Alpine Log Bed is hand hewn or draw knifed to give it its unique character. The bed is constructed of three inch logs that are mortised, tenoned, screwed and glued together. The double side rails ensure that the bed is sturdy and solid. The Alpine complete bed consists of headboard, footboard, side rails and bed slats. Finishes include clear lacquer and honey pine.